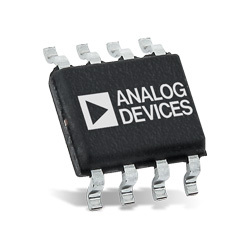 Analog Devices ADuM5020 and ADuM5028 isoPower DC-DC converters are low-emission, isolated DC-DC Converters based on iCoupler technology. The converters offer regulated, isolated power that is below CISPR22 Class B limits at full load on a two-layer PCB with ferrites. The devices remove the necessity to design and build isolated DC-DC converters for applications up to 500mW. The iCoupler chip scale transformer technology is employed for the magnetic components of the converter. The result is a small form factor, isolated solution, perfect for space-constrained applications. The devices are provided in two different package variants. The ADuM6020 is offered in a wide body, 16-lead SOIC_W package and the ADuM6028 is offered in a compact eight-lead, wide body SOIC_IC.